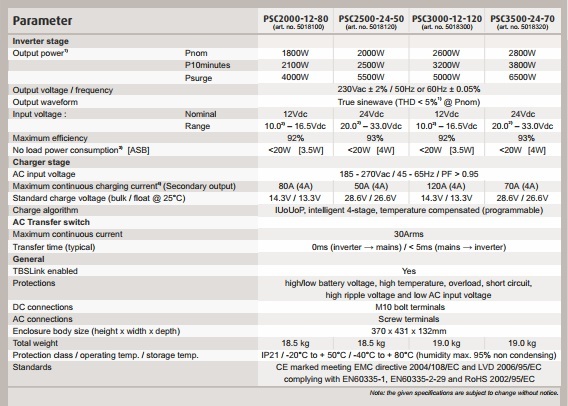 The PSC2000-12-80, PSC2500-24-50, PSC3000-12-120 and PSC3500-24-70 are compact all in one combinations of a true sinewave inverter, a powerful battery charger and an automatic transfer switch. 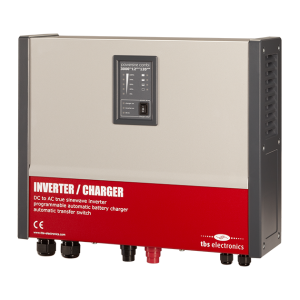 An ideal power station solution for Caravan, RV, Marine or off-grid solar applications. 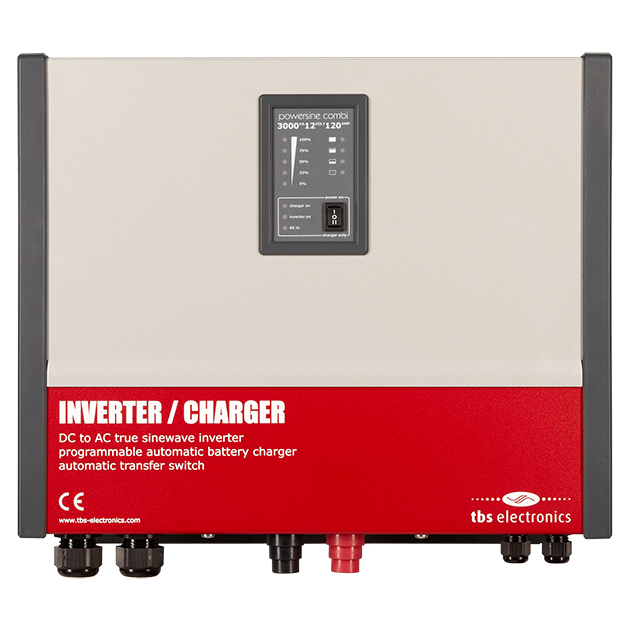 The Powersine inverter-charger recharges the house batteries when AC power (from grid or generator) is available at the input. The device also allows any surplus AC power to pass through and power downstream AC loads, such as a television or microwave oven. When there is no AC power available, the unit inverts DC battery power into clean AC electricity. All this is done automatically and the AC transfer switch operates extremely fast, not disturbing any AC loads connected to the output. The device has an automatic standby function which reduces the already small no-load power consumption by an extra 70%. Furthermore, the Powersine Combi is equipped with a TBSLink port to connect to a TBS Remote Control or to a Windows device for easy step by step configuration and readout through the TBS Dashboard software. The Powersine Combi offers many innovative features like AC Input Power Boost, which temporarily assists weak AC input sources when more power is needed than available. This for example, allows the use of a smaller generator which reduces the overall system costs. Another feature is AC Input Current Limit, which limits the maximum current consumed from the AC input source by the Powersine Combi in charger mode. The Powersine combi devices are well known thanks to their high efficiency and robust design. Moreover, these inverter-chargers are equipped a powerful 4-stage battery charger. Just like the regular inverters, the inverter-chargers of TBS Electronics are all protected against high or low battery voltage, high temperature, overload and short circuit.